If any more proof were needed that Cities: Skylines' editor lets modders do just about anything, here's CityCopter. 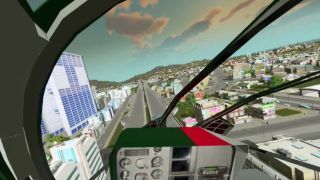 Currently in development, it's an attempt to add SimCopter style flying into Colossal Order's city builder—letting players enjoy their city from the comfort of the cockpit. The mod will be launching into alpha soon. After that, its creator—"InconsolableCellist"—hopes to expand CityCopter with missions and purchasable helicopters. There's also a "proof-of-concept" for an Oculus version. Head to the mod's dedicated subreddit page to keep track of its development and upcoming release. For more Cities: Skylines mods, including a somewhat similar "Flight Cimulator" mod, check out our list of the best mods, maps and assets.